Imperfect Union, a solo exhibit of new works by Shepard Fairey. This show displays a provocative collection of politically charged paintings, screen prints, stencils, album covers and mixed media pieces rich with metaphor, humor and seductive decorative elements. Imperfect Union is derived from the first line of the U.S. Constitution “We the people of the United States, in order to form a more perfect union”. For Shepard Fairey, critiquing the imperfect union, far from disparaging the United States, is a patriotic step toward shaping a more perfect union. The exhibition is comprised of artworks which scrutinize the dynamics of the imperfect union such as the unholy union of government and big business and the dichotomy of symbols and methods associated with ideologies of the American Dream. Faireyâ€™s artwork comments on underpinnings of the capitalist machine and monolithic institutional authority critiquing those who support blind nationalism and war. Conversely, Fairey recognizes that most individuals would rather suffer than stand up for their beliefs as illuminatingly expressed in the Declaration of Independence with the statement “all experience hath shown that mankind are more disposed to suffer, while evils are sufferable than to right themselves by abolishing the forms to which they are accustomed.” Fairey celebrates the role of counter culture, and independent individuals willing to question the cultural paradigm and advocate peace. 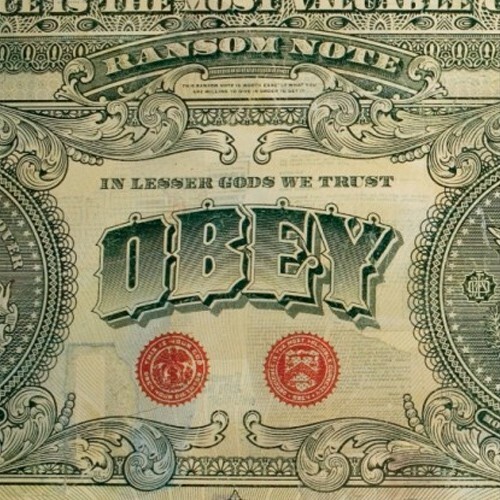 Fairey employs the graphic language of the subjects he critiques or celebrates blending Art Nouveau, hippie, currency and revolutionary propaganda styles. His works utilize bold iconography coupled with decorative elements and, upon closer inspection, reveal sophisticated layers of collage. The resulting pieces are both boldly aggressive and seductively subtle.